Review of Myers, ed. - "THE DIARIES OF REUBEN SMITH, KANSAS SETTLER AND CIVIL WAR SOLDIER"
Housed at the Kansas Historical Society archive, the diaries and other writings of Englishman and naturalized U.S. citizen Reuben Smith are remarkable records of early Kansas history and Civil War era conflicts along the Missouri-Kansas border. Editor Lana Wirt Myers deserves a great deal of credit for grasping the exceptional nature of the Smith materials and seeing the great value of bringing them to publication. The resulting volume, The Diaries of Reuben Smith, Kansas Settler and Civil War Soldier, is refreshingly out of the ordinary. While the dated entry format of Smith's writings is akin to that of a typical diary or journal (though often covering very long periods of time under a single date heading) and Myers consistently refers to them as such, one thing that needs to be said straight away is that the "diaries" of Reuben Smith in their surviving form should really be considered a combination diary and memoir. 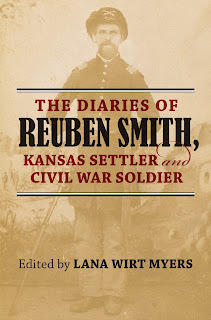 According to the The Kansas Historical Society archive database, the "Reuben Smith Diaries, 1854-1904" collection consists of bound volumes (mostly typed) that "include, but are not limited to, journal entries, newspaper articles and pictures, military records, state government records, correspondence, speeches, and travel records." Created long after the war, the typewritten diaries are liberal self-edits/rewrites of Smith's contemporary journals with other source materials spliced in. Without suggesting a range of possible dates, Myers notes that Smith's granddaughter on numerous summer visits witnessed Smith typing the diaries himself, and the marginalia is written in his own hand. A question that begs what might be an unknowable answer is just how much original journal text is preserved in the typed diaries. One wishes that Myers, who is now the reigning expert on the material and perhaps best positioned to offer the most informed opinion, had addressed this important concern in the book. While the edited and revised version we have today certainly retains significant historical value, the credibility of the diaries in terms of documenting history in the immediate moment is debatable. The Diaries of Reuben Smith, Kansas Settler and Civil War Soldier does not contain the entirety of the Smith diaries. Myers selected what she felt to be the most interesting sections for inclusion in the book. In addition to contributing a general introduction she often fills time gaps with other materials in a helpful manner. Myers also provides useful bridging narrative both at the beginning and within chapters. Notes are pretty sparse, averaging only a few for each chapter. Given the unusual nature of the material overall and the many obscure individuals introduced in the text, more extensive annotation of persons, places, and events would have been very welcome. The nineteenth-century travelogue nature of several significant parts of the Smith diaries should interest many readers. In his writings Smith offers a lively record of his 1854 voyage to America and eventual settlement in Kansas during the most turbulent period of that state's history. Long after the Civil War ended, Smith returned to the land of his birth for an extended visit, and his detailed observations of the differences between the two nations in their society, wealth, and progress (written from the perspective of an individual intimately familiar with both countries but a fierce defender of his adopted U.S.) are fascinating to read. In the realm of firsthand accounts of Civil War service in the field, the Smith diaries are in rarefied air. Less than a handful of diaries and letters written by Missouri State Militia officers or men have ever been published. Additionally, no one has authored anything approaching a comprehensive history of the MSM even though the organization was the primary military force charged with guarding Missouri from Confederate incursion and actively confronting guerrillas in the state from the midpoint of the war onward. Such rarity confers exceptional value to any new publication of material that might add to the conversation. The fact that Smith also commanded a company of Kansas State Militia cavalry during one of the largest and most significant campaigns fought west of the Mississippi River only compounds the overall uniqueness of his recorded experiences. Given the shared animosity between even the Unionists of both states, the club of officers that led companies of both MSM and KSM units into battle at one point or another is more than likely a rather exclusive one! At the outbreak of the war, Smith enlisted in A.G. Newgent's battalion of Missouri Home Guards recruited from the area around Kansas City and was appointed the unit's commissary sergeant. When that formation was disbanded, Smith was commissioned a lieutenant in the 2nd Battalion of Cavalry, Missouri State Militia. Why Smith, who owned a farm in Osawatomie, did not join a Kansas volunteer regiment is unexplained, but his lengthy descriptions of his militia service (which primarily consisted of guarding communications, fighting guerrillas, and rooting out the guerrillas' support network along the border) offer informative insights into a generally neglected aspect of the Civil War in Missouri. Guerrillas associated with Quantrill's band were frequent targets of Smith's company, and at one point Smith personally ordered the burning of Cole Younger's mother's house. While not offering much in way of detailed information about the battle itself, the diaries also delve at some length into events surrounding the Battle of Lone Jack, an 1862 engagement that prominently involved the MSM. In March 1863, Smith's MSM battalion was mustered out of the service, and he was commissioned to recruit a company for a new Kansas Colored Regiment that was forming. However, ill-health stifled that opportunity, and Smith was sidelined for an extended period of time. When he was well enough to return to the war in the summer of 1864, Smith was appointed to a detective position in the provost marshal service. Making use of Smith's intimate knowledge of the local landscape and population, his superiors sent him into western Missouri in September of that year to gather intelligence about what Confederate sympathizers in the region knew of Sterling Price's impending invasion of the state. Wishing to more actively participate in the looming campaign against Price's army, Smith joined Company A of the 5th Regiment, Kansas State Militia (eventually replacing its inexperienced captain). He vividly describes in his diary much of the confusion that reigned on both sides of the border as Price's army approached from the east and informatively recounts the struggle to arm, equip, and train his men in time to block what they assumed to be a planned enemy attack across the border into Kansas itself. By a combination of threats and persuasion, the KSM units crossed over into Missouri and played an important role in the Union victory at Westport, and Smith's diaries offer a fairly extensive record of the activities of the 5th KSM on both sides of the Big Blue River during the campaign. After Price's Confederate army was finally driven from the region, Smith once again left the army. On the first day of 1865, he was appointed Special U.S. Detective for the District of South Kansas and served in that capacity for the duration of the war. Upon discharge Smith returned to his Osawatomie farm, but soon heeded a new call. He was elected to the Kansas House of Representatives in 1868 and 1872, and his diaries provide interesting insights into local and state politics of the period. Other employments include two stints as steward of the Kansas State Insane Asylum, bank cashier, and county commissioner. Never retiring completely, Smith still occupied the last position when he took ill and died in 1905. For all the reasons mentioned above, the volume represents a truly remarkable collection of documents. 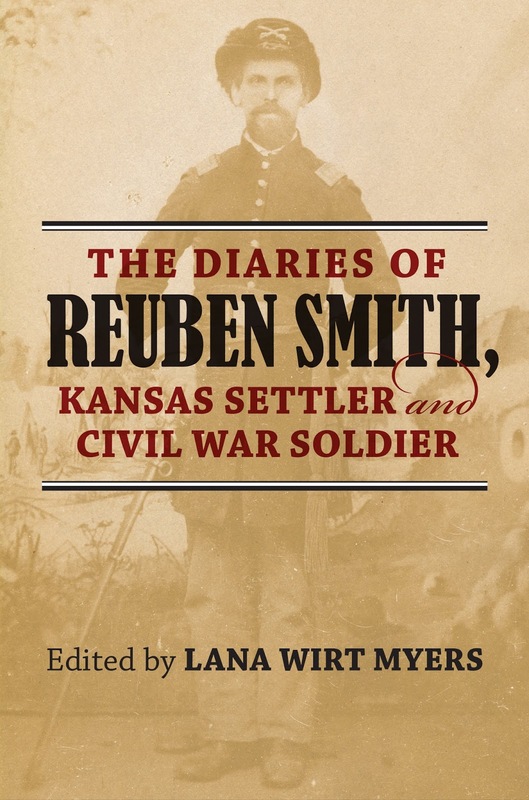 The Diaries of Reuben Smith, Kansas Settler and Civil War Soldier is highly recommended reading for students of early Kansas state history as well as those with an abiding interest in neglected corners of the Civil War in the Trans-Mississippi theater. Blogger ID not required to comment, but please SIGN YOUR POST with your name. Otherwise, your comment may be rejected. Also, outside promotions are not allowed in the comments section. Click here for ad info. 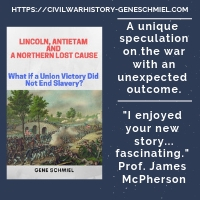 CIVIL WAR BOOKS and AUTHORS is a non-fiction American Civil War book review journal, with commentary, publishing news, interviews, reading lists, and profiles of upcoming releases. ► Farragut's Captain: Percival Drayton, 1861-1865 by Peter Barratt. ► A Bloody Day at Gaines' Mill: The Battlefield Debut of the Army of Northern Virginia, June 27, 1862 by Elmer R. Woodard, III. ► Confederate Generals in the Trans-Mississippi, Volume 3: Essays on America's Civil War ed. by Lawrence Lee Hewitt and Thomas E. Schott. ► The Civil War on the Rio Grande, 1846-1876 edited by Roseann Bacha-Garza, Christopher L. Miller, and Russell K. Skowronek. ► The Vicksburg Assaults, May 19-22, 1863 edited by Steven E. Woodworth and Charles D. Grear. ► Rosebud, June 17, 1876: Prelude to the Little Big Horn by Paul L. Hedren. ► Life In Jefferson Davis' Navy by Barbara Brooks Tomblin. ► Attack at Daylight and Whip Them: The Battle of Shiloh, April 6-7, 1862 by Gregory A. Mertz. ► An East Texas Family’s Civil War: The Letters of Nancy and William Whatley, May–December 1862 edited by John T. Whatley. ► Leonidas Polk: Warrior Bishop of the Confederacy by Huston Horn. ► Campaign for Wilson's Creek: The Fight for Missouri Begins, Updated Edition by Jeffrey L. Patrick. ► Held in Highest Esteem by All: The Civil War Letters of William B. Chilvers, 95th Illinois Infantry edited by Thomas A. Pressly, III and Gary D. Joiner. ► Meade and Lee at Bristoe Station: The Problems of Command and Strategy after Gettysburg, from Brandy Station to the Buckland Races, August 1 to October 31, 1863 by Jeffrey William Hunt. 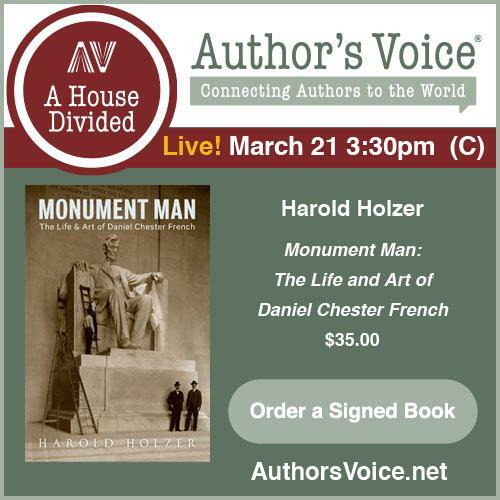 ► Morris Island and the Civil War: Strategy and Influence by C. Russell Horres, Jr.
► Union Command Failure in the Shenandoah: Major General Franz Sigel and the War in the Valley of Virginia, May 1864 by David A. Powell. ► Lincoln, Seward, and US Foreign Relations in the Civil War Era by Joseph A. Fry. ► Raising the White Flag: How Surrender Defined the American Civil War by David Silkenat. 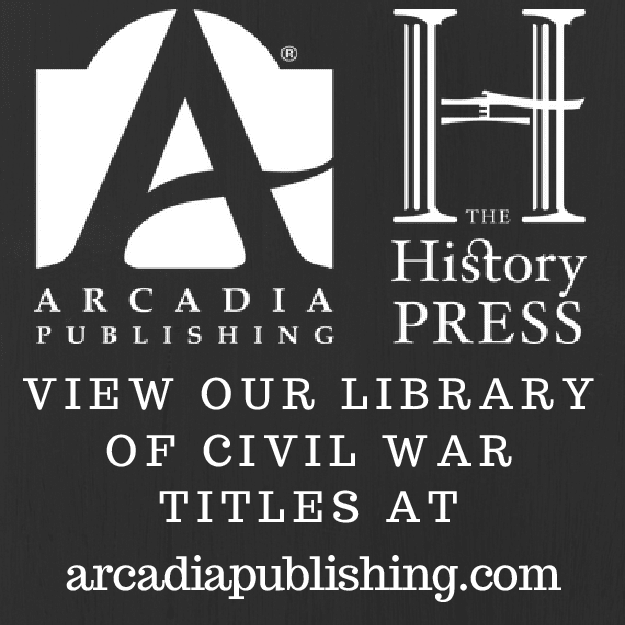 ► The Seventh West Virginia Infantry: An Embattled Union Regiment from the Civil War's Most Divided State by David W. Mellott and Mark A. Snell. ► Presidents, Battles, and Must-See Civil War Destinations: Exploring a Kentucky Divided by Cameron M. Ludwick and Blair Thomas Hess. ► Decisions of the Atlanta Campaign: The Twenty-One Critical Decisions That Defined the Operation by Larry Peterson. ► Longstreet at Gettysburg: A Critical Reassessment by Cory M. Pfarr. ► The Fight for the Old North State: The Civil War in North Carolina, January-May 1864 by Hampton Newsome. ► The Kentucky Campaign of 1862 and Battle of Perryville (2 Vols) by Kenneth A. Hafendorfer. Copyright (c) 2005-2019 by Andrew J. Wagenhoffer. All rights reserved. No material from this website may be reproduced without permission. Copyright (c) 2005-2019 by Andrew J. Wagenhoffer. All rights reserved. Awesome Inc. theme. Powered by Blogger.